Eckville Shelter, Penn., AT NOBO mile 1228.5, Thursday May 1, 2014 — I found it! I found the Pennsylvania rock stash, the Fort Knox of the Keystone State, the horde of hordes, and the Salomon’s mine of all things hard!!! I was picking my way through a poorly marked boulder field, worried about whether I was on course or not and there it was. It was like I’d found an Aztec pyramid in a small clearing. It was almost hidden in plain sight. With such a find, Indy would have been proud. But now we know where the Pennsylvania trail crews stash their rocks for future use. Rocks don’t wear out very often, but when they do what’s a trail crew gonna do? Replace ’em of course. Then there’s new trail that must maintain Pennsylvania’s repetitional standards. That adds up to a lot of rocks. Other than the big find, the day was pleasantly warm and humid. The deluge of recent rain was sweating itself out of the very ground itself turning the trail and Forest Service roads into rivers of runoff. The walking was sloppy but swift. 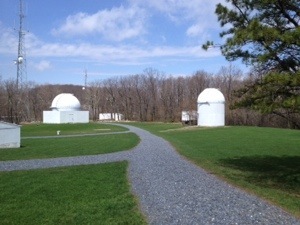 I lunched at a local astronomy club’s observatory. It has, count them, five telescopes! No idea what kind they are or their focal length, but there are no towns or cities nearby, so the light pollution must be tolerable. All-in-all a very good day and the third night on the trail in a shelter with a door! 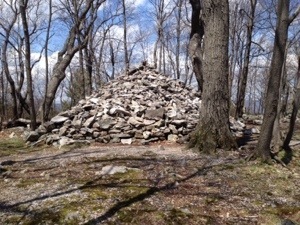 Bake Oven Knob Shelter tomorrow. 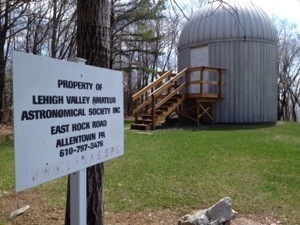 I visited the Lehigh Valley astronomy web site. http://www.lvaas.org/ I looked at their gallery of pictures of equipment. They have some nice stuff. Why on earth would they pile up the rocks like that? Seems like it was dumped by a passing star cruiser to aggravate the locals. The source of the rock pile is I known. Since it is several miles from the astronomy club location, I have to deduce that they’re unrelated. I have a video of the water runoff that I’ll try and post when I have sufficient bandwidth. What is that pile of rocks – a grave? BTW, the biggest PA rock stash is the Hickory Run State Park boulder field in Poconos. It’s huge, about 16 acres. 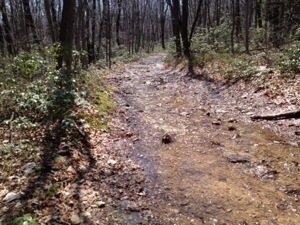 Good that it isn’t anywhere near the AT, so “they” can’t throw the rocks on the trail. Happy hiking! You seem to be going forward with effortless ease, you haven’t mentioned pain and blisters once! I haven’t had a blister in 30 years – knock on wood! As for pain, everything is relative.